From the west, follow the national forest access sign posted alongside Highway 12 by the bridge that crosses the Clearwater River at Kamiah. Turn onto Kamiah-Pierce Road 100. 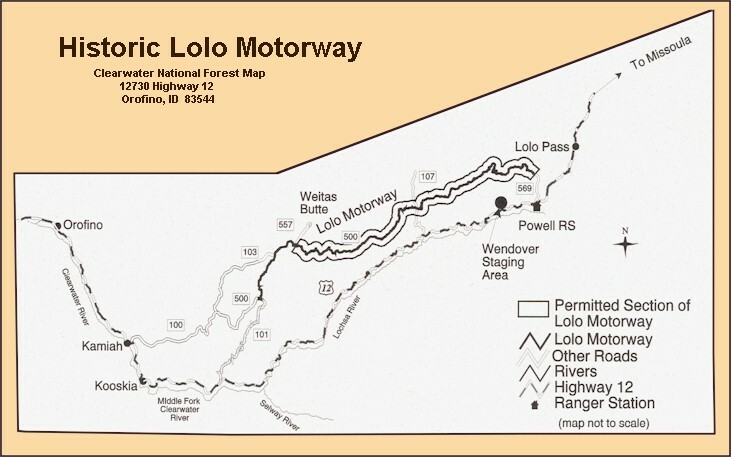 Follow Road 100 to Lolo Forks Campground. You'll cross a bridge and turn right on to Forest Road 500. Fourteen miles and 45 minutes later you'll come to Canyon Junction, a five-point intersection. Road 500 turns into a narrow, unsurfaced travel way at this junction, and remains that was as you continue eastward along the route. It's 73 miles from Canyon Junction to Powell Junction where Road 569 meets Road 500. This segment is the historic Lolo Motorway. From Kamiah to Powell, you'll travel 119 miles. Or, from the west, get to Road 100 by driving east from Weippe, off Idaho State Highway 11, which leaves Highway 12 at Greer.